Metrohm is proud to announce the launch of the Eco IC, a cost-effective new ion chromatograph designed for routine analysis. Eco IC delivers performance and productivity for price sensitive markets such as environmental testing and higher education. 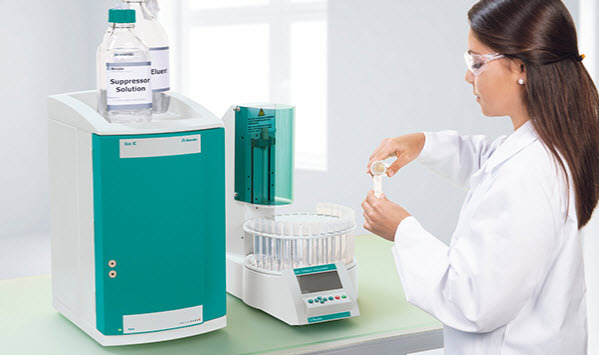 Suitable for the routine analysis of anions, cations and polar substances, Eco IC uses Metrohm’s unique approach to ion chromatography to deliver faster separations, higher sensitivity and better method robustness, all while maintaining affordability. Complementing the launch of the Eco IC is a new line of columns ideal for common anion analysis by various EPA methods, including EPA 300.0. As consumables such as columns have the greatest impact on lab operating costs, Metrohm designed these new columns to deliver high performance, longevity and budget-friendly pricing. Eco IC delivers with all components needed for analysis: suppressor, conductivity detector, and software. An optional autosampler offers automated analysis of up to 36 samples.